There are seven of these little robots, which Nissan engineer Susumu Fujita began creating in 2009. Their programming has been evolving, but Fujita says it's basically an algorithm that mimics how fish swim in the ocean. 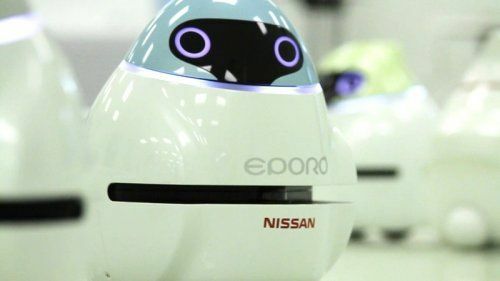 Standing about two feet high and resembling chicks (baby chickens), these robots are a part of Nissan's research into zero emission robot car concepts. They can move around in groups, run solo, or play "follow the leader" - all without running into obstacles or missing their destination. This is the first time the robots have visited the United States, but they have a new second home in Nissan's new Silicon Valley (NRC-SV) facility that just opened this week. When running in a big group, the EPOROs "school" like fish, taking cues from one another to avoid obstacles and keep safe distances between each other so as to avoid collision. Running solo, they use their sensors to avoid obstacles and change direction or speed to avoid obstacles and to reach their intended destination (if any). In "follow the leader" mode, they move in a single file "road train", one after the other, taking their cues from the leader, but always on the lookout for problems that could affect their equilibrium. “The technology in these robots is similar to what will be used to build and perfect an autonomous car. The EPORO can already follow the leader, even if the leader is me,” said Fujita in an interview (below). Today's Nissan vehicles already sport some of the technologies being pioneered by research with these robots. Intelligent Brake Assist and Forward Collision Warning are safety features that stem from the EPORO project.